This worksheet of empty boxes has a definite purpose! Kids fill in the missing number in each box as they count all the way from 1 to 20. 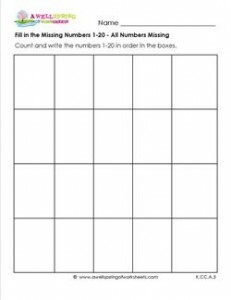 Please go to this page to see all the fill in the missing number 1-20 worksheets in this set.